located in Mecklenburg-Vorpommern between Hamburg, Ratzeburg and Schwerin, you will find here plenty of rest in a rural idyll and relaxation from everyday life. 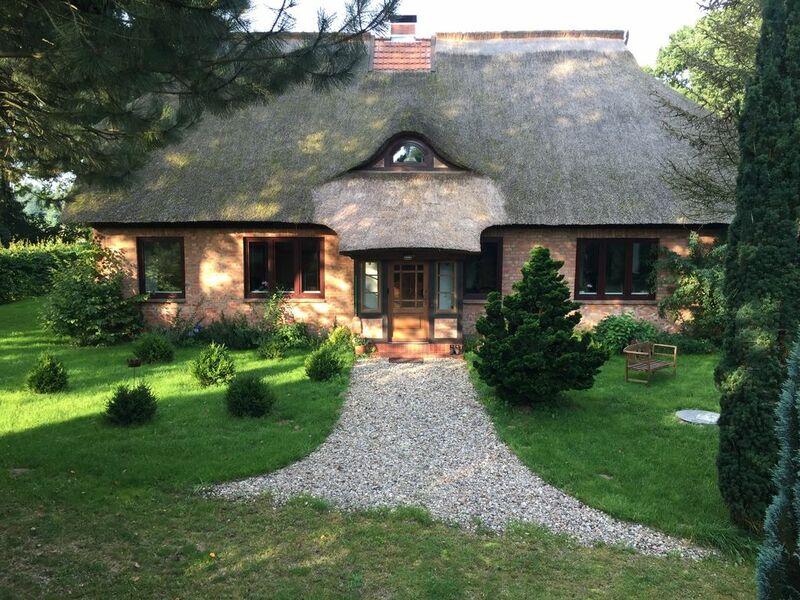 Enjoy your vacation, your weekend or simply a break in our thatched Forsthaus, which was 2014 / completely renovated, 2015. The Forsthaus is located on the outskirts of Kölzin and can only be reached via a private road. It has 2 apartments on the ground floor (apartment "Schaale" 50 m² or Apartment "Fuchsberg" 70 m²) and 1 apartment on the top floor (apartment "Cupid's Ruh '80 m²). During the renovation, we have made a point, as much as possible to maintain the original charm of the house. So the many exposed beams, old floors, tables made of old doors, wardrobes from old beams and the clay wall rediscovered create a harmonious atmosphere on the ground floor. Complete this is mostly antique furniture which have been lovingly arranged next to new furniture throughout. In the large garden, with its old oaks and fruit trees, invite many seating to relax and unwind or a leisurely barbecue. The children can play to their hearts content or play in the sandbox. The large apartment "Fuchsberg" (2 - 4 pers.) On the ground floor comprises 1 living room with sofa bed (full reclining area of ​​1.40 mx 2.00 m), 1 bedroom with 2 single beds, satellite TV, shower room (hair dryer available) guest toilet, open kitchen with dining area, direct access to the garden with terrace. The price / night is 80 € (October - April) or 90 € (May - September). Further extra costs are not incurred. Of course you are free parking and in front of the premises. Towels, sheets and cleaning are included. Travel cot and high chair, we're happy to provide. Prices for pets are available on request. Kölzin belongs to the municipality Kogel, 4 km from Zarrentin away, so close to the UNESCO Biosphere Reserve Schaalsee with its unique flora and fauna. Many migratory birds use the Schaalsee region also as a resting and resting place. The Schaalsee is with a length of 15 km, a width of 6 km and a depth of 72 m the deepest lake in northern Germany and was for decades in the shadow of the former inner-German border unfold undisturbed. So he's one of the most charming landscapes of Central Europe. Anyone wishing to experience peace and nature is right here. The Forsthaus Kölzin is an ideal starting point for excursions into nature or for trips to nearby, traditional towns like Ratzeburg, Rehna, Ludwigslust, Schwerin, Hamburg or Lübeck, but also for a trip to the Baltic Sea. Enjoy the countryside by bicycle or on foot and explore the beautiful landscape so. There are a host of cycling and hiking trails around the Schaalsee. Kölzin itself is am Radwanderweg Schaalsee same and so there is a big catch and playground that invites you to linger. A visit to the horse and Horse Farm the Kruse family is possible. In Zarrentin is possible to rent bicycles and boats or to sunbathe on the beach and then swim in the Schaalsee. Visit there the information center or the exhibition at Pahlhuus, the Moorlehrpfad or the monastery with the museum. About the offer of cultural events you can always check on the spot (eg. In the Schaalsee Info or in Zarrentin Convent). At the end of the day then at a restaurant or inn enjoy the local fish or game dishes. And by the way: Even skiing is possible for us - in every season. by continuing simply in the ski and Alpincenter Wittenburg. Explore the beautiful Schaalsee region and be our guest.